Every year we go running to the stores to find ourselves anything pumpkin related we can get our hands on. Pumpkins don’t only decorate our porches but they also fill our plates, and it’s good they do, since pumpkin contains a lot of health benefits. So, let’s explore why you need to find reasons to eat pumpkin all season long, learn some interesting facts about pumpkin and we’ll also go over some of my favorite simple, healthy pumpkin recipes! Pumpkins are a form of squash. Actually, they are part of the Cucurbita family which includes squash, cucumbers, watermelon and cantaloupe. They are technically a fruit although similar to tomatoes are often called vegetables. Pumpkins come in a variety of colors including green yellow, red, white, blue and even multicolored. They also come in all sizes and shapes and some are purely decorative while some are well suited for eating. The biggest pumpkin recorded in the Guinness Book of World Records weighed 2032 pounds and was presented in 2013 in Napa, CA. You don’t want to try to eat the pumpkins you buy for carving – they are very tough! The best pumpkins for eating are generically called sugar pumpkins or pie pumpkins. Some specific names include: Baby Pam, Fairytale, Long Pie, Baby Bear, Cinderella, Long Island Cheese, New England Pie, Autumn Gold, Ghost Rider, Lumina (which are white), Fairytale and Winter Luxury. Since pumpkins really are just a form of squash, you can roast them or serve them mashed, just as you would the beloved butternut squash! A Starbuck’s Pumpkin Spice Frappuccino (grande) made with whole milk and including whipped cream has 450 calories and 73 grams of sugar! Yowza – 73 grams of sugar is over 18 teaspoons which translates to over 1/3 a cup of sugar in your beverage!!! The venti size has even more! Pumpkins are very nutritious! They are low in calories, high in fiber and contain anti-oxidant vitamins such as vitamin-A, vitamin-C and vitamin-E. They are also a good source of B vitamins, and minerals such as copper, calcium, potassium and phosphorus. Let’s look a little closer at how pumpkin benefits our bodies. They are loaded with Vitamin A (one cup is 200% of your RDA) which keeps your eyesight healthy, especially in dim lighting. Aside from its main job of providing healthy eyesight, Vitamin A is also good for your skin and bones and keeping your immune system strong. Pumpkins are full of potassium! You might know that bananas are known for their high amounts of potassium, but pumpkins contain even more potassium than banana’s. Potassium is great to consume after a work-out as it restores the body’s balance and keeps your muscles functioning smoothly. Your heart needs potassium to beat properly and regulate blood pressure. It’s also able to reduce cramps and boost your metabolism. Pumpkin seeds contain tryptophan — an amino acid that assists in making you sleep like a baby. It also helps produce serotonin, a neurotransmitter that’s responsible for making us feel happy and relaxed. So not only will enjoying pumpkin & pumpkin seeds help you sleep great, it can also boost your mood! Pumpkins are high in beta-carotene (one of the best-known sources) which may play a role in cancer prevention according the National Cancer Institute. Beta carotene can also offer protection against asthma and heart disease and delay the aging process (according to Megan Ware RDN LD and Dr. Karen Gill). We’ve all heard of vitamin C and the magic it can do when you’re feeling under the weather. 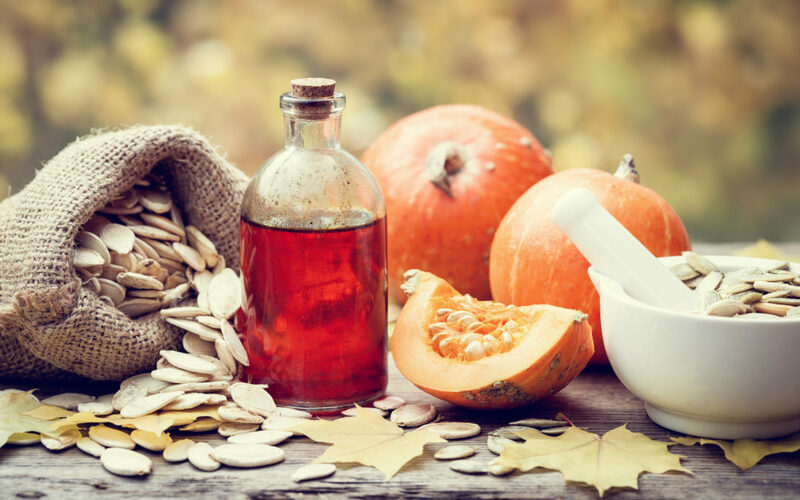 Pumpkin provides a nice dose of Vitamin C, among its other health benefits, so keep finding ways to add pumpkin to your meals to keep your immune system strong. Here are some of my favorite pumpkin recipes. Mix all ingredients together in food processor, blend until smooth and desired consistency. If needed, add small amounts of water. Slice and freeze bananas. Once frozen, put all ingredients into food processor and blend together. Freeze pumpkin overnight and enjoy! You may need to let it thaw slightly before serving. Combine all ingredients in food processor and blend. Scoop and roll into balls, refrigerate for 2 hours, and enjoy!